mommy's reviews: Enter the GUND Top Dog Contest! Do you have a dog that you consider to be the cutest doggie in the world? How about a dog that looks like you?? HA! I have to admit that sometimes I see someone walking their dog and oddly enough, they resemble each other..whether it be their hair, body style (fat, thin, etc.) or build, sometimes dog owners pick out dogs that look like them! I always think of the 101 Dalmatians movie where the froo froo Poodle looks like her froo froo, stuck-up madam, or the short stubby Pug looks like his short and stubby fella that is walking him. Well, if you think that you have one of the cutest dogs on the planet, then I have a great contest to share with you today! For more than a century, GUND has been creating unique teddy bears and other soft toys recognized the world over for their quality and innovation. 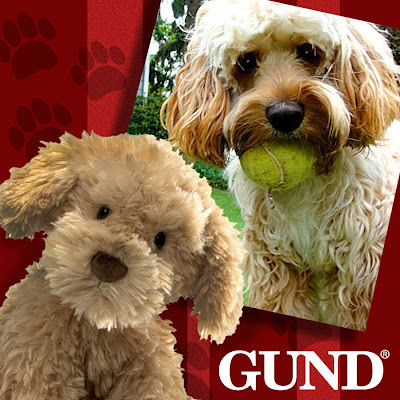 The leading soft toy manufacturer in the U.S., and also the oldest, GUND was founded by German immigrant Adolph Gund in Norwalk, Connecticut in 1898. GUND was one of the first companies to design and produce teddy bears in the early 1900’s. Today, the company manufactures an extensive collection of unique characters and licensed plush under the GUND, and babyGUND brands. GUND is known worldwide for its top quality, soft and huggable plush designs and gift products. Award-winning GUND products appeal to all ages, from infants up, and are perfect for both play and collecting. Based in Edison, New Jersey, GUND distributes throughout the United States and Canada as well as in Europe, Japan, Australia and South America. GUND products may be found in gift, specialty, toy, book, museum and department stores and many other retail outlets. Starting today, GUND is launching their first ever GUND Top Dog Contest! Want to know more? Here are all the details! The first ever GUND “Top Dog” Contest will commencethis Monday, July 16, 2012 with a grand prize of “the Boo treatment” - a limited editionGUND plush in the winning pup’s likeness! Submit your dog photos via the contest tab on GUND’s Facebook page (www.facebook.com/GottaGettaGUND), which will be live on Monday, July 16, 2012 at 12:00 a.m. EST. The contest will run July 16 - August 15, 2012; winners will be chosen the week of August 20th and announced the week of August 27th. 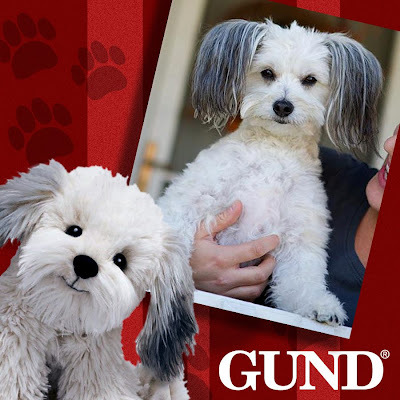 Simultaneously with the “Top Dog” Contest on Facebook, GUND will run the “Most Pinteresting Dog” Contest on Pinterest. Consumers will be asked to post their entry on their own pages, “tag”@GUNDMostPinterestingDog and submit the link to GUND at MostPinterestingDog@GUND.com. The “Most Pinteresting Dog” Contest winner will be selected based on the number of times the entry is “liked” on the GUND Pinterest board and the winner will receive a selection of GUND products valued at $250 retail. For complete rules, see “Top Dog” Contest and “Most Pinteresting Dog” Contest rules at www.GUND.com. So, there you have it! I would love to hear about your dog and why you think he/she should win this contest! Oh, and if one of you happen to win, TELL ME ABOUT IT!! You can even share your photo that wins and I will post it here! How cute would that be??? Get your entry in today and good luck to all of you who enter!! Disclaimer: I received no monetary compensation for this post. I will be receiving free product in exchange for my post. All quotes and stock photos are from the GUND website and email. All thoughts and opinions are 100% mine.